If you would like to not only learn Garageband, but also learn how to use it (or any recording software) to easily make hit-quality recordings, I invite you to read on, explore the site, but most of all, get yourself signed up for my free home recording lessons. Do it right now, right here. And then keep reading. 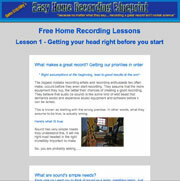 My free home recording lessons and my Easy Home Recording Blueprint are easy to follow and will show you exactly how to get started using the exact same simple methods I use to record songs and music for movies, tv, cd release, etc etc. And yes… I record everything I do on Garageband right at home. So, if you need a good reason to learn Garageband and how to use it properly, all the proof you could ask for is right here. First of all… hi. My name is Owen Critchley and I have recorded, and continue to record for major labels, indie labels, have written and recorded songs for other major label artists, for almost 20 years. However, 3 years ago, I made a change. I simplified my home recording studio drastically. I didn’t have to do it. I did it because my studio was getting to the point that it had a life of its own. I was spending more and more time looking after its problems and its needs. So I decided enough was enough. I thought to myself, there must be a simpler way… a more enjoyable way for me to record my work. As I began stripping down the studio, I decided I would learn Garageband and see how far I could take it. I must say it was love at first sight. But, the tools in Garageband at first glance, seemed almost too simple and I began to wonder if I would miss the bells and whistles of my big box recording software I had been using. It turned out I needn’t have worried. The simplicity of Garageband is deceiving, because it’s actually a very powerful tool that will reward you with astonishing sound quality. However, even though it is very simple to learn Garageband and record something, I have created a step by step method for exactly how to record on Garageband, that puts Garageband’s recording quality into overdrive. You see, the keys to the kingdom are in the details. You will learn Garageband here, yes… but more importantly you will learn which details to focus on and the right sequence of steps to record truly impressive pro-quality recordings. None of it is difficult, but it’s important you know the blueprint to learn Garageband properly. It’s not the power of the software that will get you your great record, it’s the power of the method. And simplicity is at its core. All great records depend on this ability and it’s time for us to get this ability back, before any more great music gets poorly recorded by artists who are lost in a sea of cables and complicated equipment. Sign up now for much much more… you’ll see.